Hitting out at Bahujan Samaj Party (BSP) and Samajwadi Party (SP) governments in Uttar Pradesh over corruption, BJP president Amit Shah on 21 September alleged that people of the state were left empty handed while the leaders of the two parties flourished under their rule. He also alleged that while SP was committing atrocities on Dalits, BSP supremo Mayawati was exploiting them and claimed that only BJP can ensure uplift of the community. "In the last 15 years, the people of Uttar Pradesh have been entangled between SP and BSP and remained where they were, while the leaders of these parties accumulated wealth," he alleged. Addressing a 'Parivartan Maha rally' organised by former BSP leader Swami Prasad Maurya, Shah raised questions on graft cases, from Taj corridor to alleged mining scam linked to Gayatri Prasad Prajapati. "I want to ask Akhilesh as to why was Gayatri Prasad Prajapati was removed from the ministry...corruption was cited as the reason when he was dismissed, but he was taken back within a week...is he not corrupt now," he asked. "Had there been no corruption in the mining department in the state (headed by Prajapati), every household would have got a colour TV set," Shah claimed. "Modiji is sending money to the state but it is being divided between chacha and bhatija...," the BJP national president alleged targeting CM Akhilesh Yadav and state minister Shivpal. Taking a jibe at the Samajwadi Party over the infighting, Shah said it was "bigger than Mahabharat". "Uncle (chacha) and nephew (bhatija) are throwing each other's supporters out and Amar Singh is playing the role of Narad," he alleged. Shah also tried to corner Mayawati, saying she should have used the money spent to buy her bungalows for the poor Dalits in the state. "Behenji (Mayawati) you got clear majority (in 2007)... what did you do? NRHM scam, Noida plot allotment scam, Taj corridor scam, security number plate scam, police recruitment scam," he alleged. "After a scam worth Rs 40,000 crore, she says that she will work for the betterment of the state's backwards and Dalits if voted to power," the BJP president alleged. In the rally organised under the banner of Loktantrik Bahujan Manch of Maurya, who has accused the BSP supremo of selling party tickets, Shah asked the people to tell others about the number of bungalows owned by Mayawati in Delhi. Questioning Mayawati's claims of working for improving the lot of Dalits, he claimed, "If she had distributed the money she spent on the bungalows...every Dalit household would have got an air conditioner." He also lashed out at the BSP supremo over the issue of atrocities on Dalits, saying, "As many as 1,074 Dalits were killed between 2008-2011 ...Behenji, before seeking Dalit votes you will have to give an answer on the killing of Dalits (under your government) to their Samaj." "While Mayawati exploits Dalits, SP commits atrocities on them," he alleged, adding both cannot do any good and it is only BJP which can work for their uplift on its "sabka saath, sabka vikas" motto. Shah also hit out at Congress vice president Rahul Gandhi, who is currently on 'Deoria to Dilli Kisan Yatra', alleging, "Rahul baba your family has ruled the country for 65 years... it is Congress which is responsible for farmers' plight...had the party been real sympathiser of farmers their condition would not have been like this." 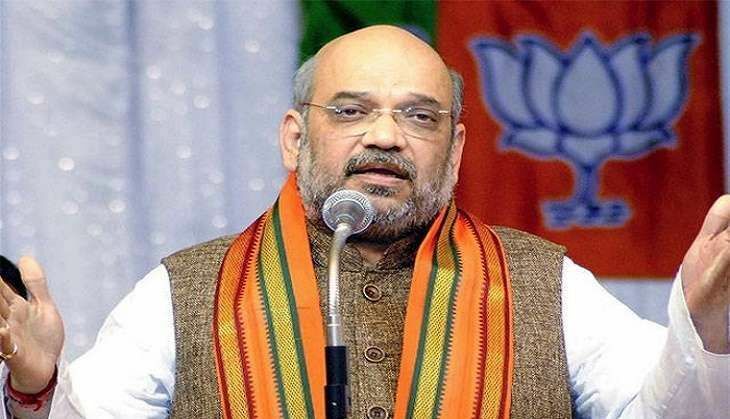 Amit Shah is scheduled to visit Mathura on 28 September for the five-day long birth centenary celebration of BJP ideologue Deen Dayal Upadhyaya. The celebrations, which will start on 25 September will also be attended by Union Agriculture Minister Radha Mohan Singh among others.